Contents: Flaming Hot Cheetos with cheese sauce. Notes: He reported that his school cafeteria sells them—not in the lunch line, but in one of the “competitive foods” lines. He said they appeal to students whose lunch period is too short to wait on a long lunch line. I think I just threw up in my mouth. I am seriously gagging over here. But lets be fair. This isn't a school lunch the student had to eat because there was nothing else available. This kid chose to buy and eat this. What the hell does this kid eat at home? Does his mom whip but a batch of Cheetos 'N Cheeze casserole every Tuesday? The linked article says students choose crap like this because their lunch periods are too short to spend "all day" waiting in line. Reeeeally? How long are the school lunch breaks? As I remember there was plenty of time to stand in line, get my lunch, eat and still have time after to goof off in the library until next period. Have lunch times been shortened in the last ten years? Yes. Lunch times must be shorter because my kids don't have time to finish their lunches. Schools shouldn't be offering these alternatives, which parents have no control over. Sure, the kid chose it, but we're talking about a kid. They don't always choose what's best for them. The kids parents may offer only very healthy food at home, and kids will still choose junk outside of home. Compare this to the post below with the Japanese lunch. Sigh. "Mrs Q", who writes the "Fed Up With School Lunch" blog, says that kids at the elementary school where she teaches get twenty minutes for lunch. That twenty minutes includes walking from the classroom to the lunchroom, lining up, getting their food, finding their seats, opening all the little containers, eating, and cleaning up. That's a lot less than I had for lunch as a kid! One of my son's schools also gives them 20 minutes for lunch, but the clock starts when they're in their seats with their food. That makes a huge difference. This was a very popular snack at a convenience store where I used to work. 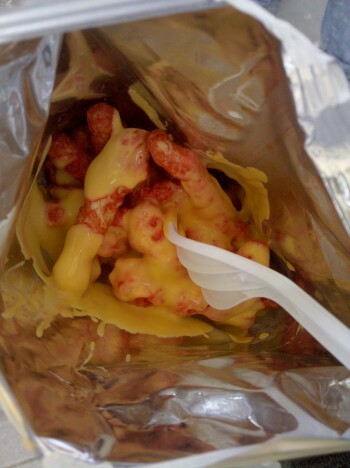 People would buy a bag of the cheetos and then take them over to the nacho machine. Surprisingly, I saw more adults doing this than kids or teenagers! @Kyushoku - My high schooler has 30 min for lunch. That time begins as soon as the bell rings. His school has 2000 students and the way the cafeteria works is that the seniors are allowed to go first in line (seriously, they are to be fed first). As a 9th grader, he had the choice of waiting in line and hoping to have time to eat or going w/ the fast food line and getting a fried chicken sandwich or something equally bad for you so he has time. Now of course, there are 4 lunch times. It's not an open campus, so they can't go elsewhere to eat. That means he's competing w/ 500 students for food and a place to sit. I WISH he'd wise up and take his lunch like my girls, but most hs kids here don't like lugging around lunch in addition to all their books. Wow! I had no idea lunch times have been cut so short these days. What the hell is wrong with school administrators? I just took a look at my old high school's website and, sure enough, lunch time is only 11:47~12:22 with fifth period starting at 12:26. I remember there being a 15~20 min break after lunch time for studying, talking or walking outside if you wanted. I usually stayed in the library. Gave us plenty of time to stand in line and finish eating without being worried that fifth period starts in 2 mins. Lunch times should never be less than 30 mins. In all my schools it was 30 and that included cleanup and walking. It was less of an issue in Elementary and middle. But in highschool sometimes it was too short. I went to a pretty big hs and although we had 4 lunch lines there was always a long wait, and if you were coming from a room at the far end of the school or the teacher let you go late you'd be at the end of the line. Sometimes we'd have less than 10 mins to eat. One of the things i remember most about school lunch was rushing to eat it and feeling sick after. As an adult im still in that habit and i eat really fast, people often comment on it. At my school we had 22 minutes for lunch. We would come from our class rooms from the back hallway, stand in line for a little over 15 minutes, try to find somewhere to sit where people weren't saving seats for their friends and have a good 5 minutes or less to eat. This doesn't include using the bathroom or socializing (which doesn't seem important, but if you are one of the students who actually does their work and receives above average grades in above average classes, then you want time to talk to your nerdy friends....or do homework). This amount of time is ridiculous because if you take longer than about 3 minutes to eat then you are made to get a late pass for class. You have about 3 times of getting late passes until you are suspended. When you complain to a person of authority about the reoccurring problem they ignore you because you are an unworthy student. A policy like that is so very unfair to students who really love school and love learning and want to be successful, just to be suspended because of long lunch lines (and they might not be able to bring lunch to school). So, what is a student to do? Go to the vending machine or the school store of course! In my school we had like 3 snack machines and 4 drink machines and two school stores located on either side of the cafeteria. It was so much easier to scrounge up some change and use a machine or the store to get your lunch. I used to eat that when I was in high school...it was very popular and the reason I got it was because it wasn't something I would get at home...its also probably the reason that I got fatter in high school...eating that everyday with a 20oz sprite and extra large peanut butter cookie will do that to a person!